Cardiopulmonary Rehabilitation is an exercise, education, and social program designed to provide physical condition, education, help with lifestyle adjustments, and support to someone who has had a cardiac event or who has breathing problems. The patient uses several types of exercise equipment; has heart rate, blood pressure, and oxygen saturation monitored; and is educated on subjects pertaining to his/her health. Anyone who has experienced a heart attack, heart failure, cardiac bypass surgery, angioplasty or stent placement, valve repair or replacement, stable angina, or heart transplant. Anyone with a diagnosis of emphysema, chronic airway obstruction (COPD), chronic bronchitis, sarcoidosis, cystic fibrosis, bronchiectasis, pneumonoconioses, and pulmonary fibrosis. Phase II – begins 10 to 14 days from discharge after a cardiac event or within 90 days of a pulmonary function test showing breathing problems & lasts 36 sessions. Phase III – begins after completion of Phase II ( or patients unapproved by Medicare may start at Phase III). It may continue indefinitely. The cost of Cardiopulmonary Phase II is covered by Medicare and/or primary insurance companies. Phase III rehab is self-pay. 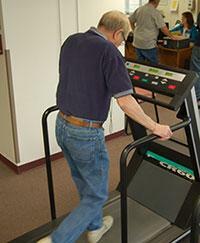 For more information contact the Cardiopulmonary Rehabilitation Unit at (309) 543-8522 between 8:00 a.m. and 4:30 p.m.